I'm totally diggin' the bathroom updates, and super jelly of what a nice bathroom it is (see my comments). A brilliant NYC score! I realized last night that I never sent you the latest pictures of Meggie V and Drewski's home updates. I got to see Meg TWICE last week which was a special treat, including when Jeff and I invited ourselves over for pizza! I've loved this home since they moved there in 2009, but I gotta say, it's never looked better. They've put a lot of thought and elbow grease into their Milton home and it shows. The whole house looks great, but I focused on the office and kitchen which I believe have seen the most change since you were last there. And the theme 'Really?' is inspired by the hysterical video you posted earlier this week. I watched it three times. Here's their home office, which Meg uses as her professional home base as she's on the road a lot. They painted all the paneling, ripped out some out-dated built-in furniture and scored this lovely chaise from craigs list. 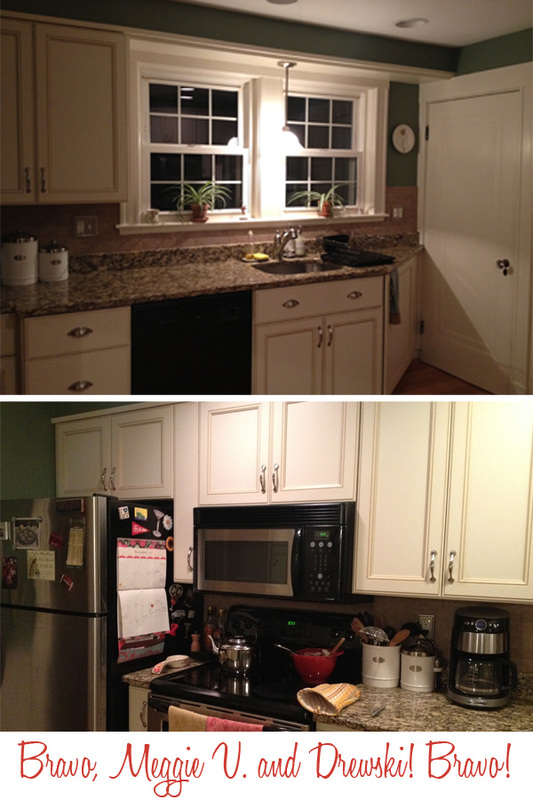 Meg and Drew also completely renovated their kitchen. New cabinet doors, drawers and pulls, counter tops, gorgeous new hardwood floors and a coat of lovely green paint. They did a lot of this work themselves and I think they did a terrific job. This kitchen is warm and charming and I scooted right into that banquette and stuffed my face with pizza like I owned the joint. Perfect. Blythe, couldn't you just die. I can't wait for you to see it in person. Thanks for all the hospitality Meg and Drew and for allowing a very impromptu photo shoot! WOW! Meg! Congrats on your gorgeous kitchen. I not only love how it looks, but I so admire your ability to make decisions (I can see myself debating and debating with something like that)! When can we move in? Love the bookcases -- they are exactly how I want my china cabinet to look -- I am going to be calling you! Thanks Katie! I feel so honored to be featured in your blog. Can't wait to see you for New Year's Eve! I'm still pissed at myself that I didn't get a better picture of the new navy hallway upstairs. Doh! I agree DH! I have enjoyed many a glass of wine there and also large quantities of guacamole -- so I am very pleased it made the cut! Gorgeous - love love it all. That shade of green reminds me of my bedroom. D- please for the love of god get a new camera. Amen, Melis. This is getting ridiculous. Don't worry, it's at the top of my Christmas list.